Last month when I blogged I told you about an exciting new series that seven authors (including myself) are working on. One by one the stories are being completed and polished and will soon be available in print and ebook on Amazon. Readers will also be able to read the series for free on Kindle Unlimited. Today I’d like to share a little about book 1. Taking a six-month sabbatical, Italian lawyer Rafaele Rossi moves from Florence to manage the family farm in Tuscany for his aging nonna after his father passed away. Convinced a family get-together is what Nonna needs to lift her spirits, he plans an eightieth birthday party for her, making sure his siblings and cousins attend. The Keswick jewelry store where Jayne Austin has worked for seven years closes its doors. Jayne decides to take her generous severance pay and move to Italy for a while—Tuscany to be precise. Choosing to leave her fate in God’s hands, she prays she’ll miraculously bump into the handsome best man she’d danced the night away with at a friend’s Tuscan wedding two years ago. She hasn’t been able to forget those smoldering brown eyes and that rich Italian accent. 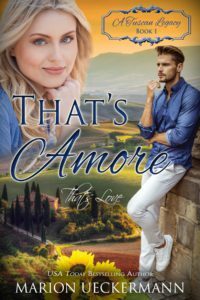 When Rafaele receives what appears to be a valuable painting titled “Lost Love” from an unknown benefactor, he’s reminded that he doesn’t want to lose Jayne again. But what kind of commitment will it take for her to stay? From the top of the road, Rafaele spotted the small car parked near the entrance to the villa. Probably some tourist taking pictures, although at the moment there wasn’t much to photograph. In a few weeks there’d be a field of yellow sunflowers to snap, plus bales and bales of hay in freshly-cut fields, the images a photographer’s dream. Of course, the lavender field looked its best now, but that was on the other side of the estate, out of sight of passersby. As he drew nearer, he noticed that the leggy woman standing beside the car, hands on her curvaceous hips, was no photographer. Rather, she seemed to be having car trouble. He shoved his hat on his head and hurried closer. Her voice… It seemed so familiar, even though she wasn’t from around here with that strong, English accent. He pointed a finger at her. “First of all, that dress is no outfit to be changing a car tire in.” Wrong color. Wrong length. But, Mamma mia, did she look great in it. Like those cherries on the fabric—good enough to eat. He chuckled and walked around the car to where she stood. Soft, flowery notes tickled his nostrils. Double Mamma mia! She not only looked good, she smelled amazing too. The woman removed her hat. Long, blond hair tumbled over her shoulders, taking his breath away. She stuck out her hand. Rafaele did the same, at exactly the same time, and gazed up at her. “It’s you,” they declared in unison. Exactly the name he was about to say, recalling the joke he’d cracked when they’d first met at his best friend’s wedding. “Hi, I’m Jayne,” she’d said as she shook his hand. “And I’m Tarzan,” he’d quipped in return before asking her to dance. Once he’d taken her in his arms, he didn’t let go all night. Unfortunately, she’d flown back to England the following day. He’d thought of her often in the beginning, but as the days turned into months which turned into years, he’d all but forgotten about their magical encounter. He stared at her, unable to stop himself. She was more beautiful than he remembered. He did now. They’d joked about it as he’d whirled her around the dance floor. Her eyes widened momentarily, and then she burst out laughing as understanding of his wit dawned. “So, w–what are you doing in Italy?” Did he sound as school-boy-crush/over-the-moon-excited as he thought he did? “Well, I’m happy you’ve returned. Welcome back to my country.” He leaned in closer to greet her Italian style. It’s not like they were total strangers, so why not? Their noses bumped. And their lips almost touched. Her soft snicker echoed his chuckle as he tried again to kiss her cheek. Another close encounter with her lips, an even closer one with her nose. Clearly she did not know the cheek kissing rule. Not that he minded her blunders. Not at all. Jayne buried her giggle in her hand. She shook her head and wiped away the moisture that sparkled in the corners of her eyes. Taking a deep breath, she composed herself enough to speak. “I’m sorry. All I can think of is cheeks, and then I get totally flustered as to which side to lean first. And…well, you know the rest.” She banged her fists together, mimicking their first two greeting attempts. He gave it one final crack. Drat. Third time lucky, much to his disappointment. Maybe his lips would’ve found hers with yet another wrong move—something he remembered wanting to do the last time he’d seen her when they’d said goodbye. And he said he’d call. “Sooo many questions…” Her mouth curved into a smile which dragged him back to time lost. Why on earth hadn’t he contacted her? When the paper she’d written her number on was misplaced, never to be found, he took that as a sign they weren’t meant to be. Yes, he could’ve asked Joseph for her contact details—he kicked himself now for not having done so—but when he saw his best friend again, he’d already convinced himself that a long-distance relationship was probably not a good idea. It was hard enough to sustain something past a few dates with local women, hence his bachelorhood at thirty. And yet another reason for his father to resent his choices. No grandchildren. No little Rossi’s to carry on the family name. He the oldest son…his duty… He’d heard the criticisms and reminders every time he visited the villa. Huh? What had he missed? Everything, it seemed by Jayne’s stare. Smiling, Rafaele squatted down beside the flat tire. He grabbed the jack from where it lay abandoned on the grass along with the wheel spanner and tried his utmost not to let his attention drift to the shapely legs beside him. He slid the jack beneath the chassis. Soon the small car leaned away from him. As he worked, he pondered those prayers. Did she mean for the tire alone? He glanced up at her. “Would you like to have dinner with me tonight? I hope you enjoyed the sneak peek into That’s Amore. I’ll be giving a copy of this eBook away once it releases (hopefully April 17th) to one reader who comments by Friday, March 9th, 2018. I look forward to hearing from you all. Hi Marion, I am so excited for this series. It sounds great- and I love that we get glimpses into (I am assuming) Joseph and Rose? April 17 is a LONG way away- there’s that whole learning patience thing going on now!! This sounds so good. I’m glad to hear the series will be available through kindle unlimited! Looking forward to this new series!! April is so far away…lol! LOL, for the reader yes. For the writer, no :) We can’t wait to release this series. I cannot wait for this series to come out so I can read it! I loved the snippet and can’t wait to see what happens! I haven’t read many stories set in Italy and look forward to reading this one! 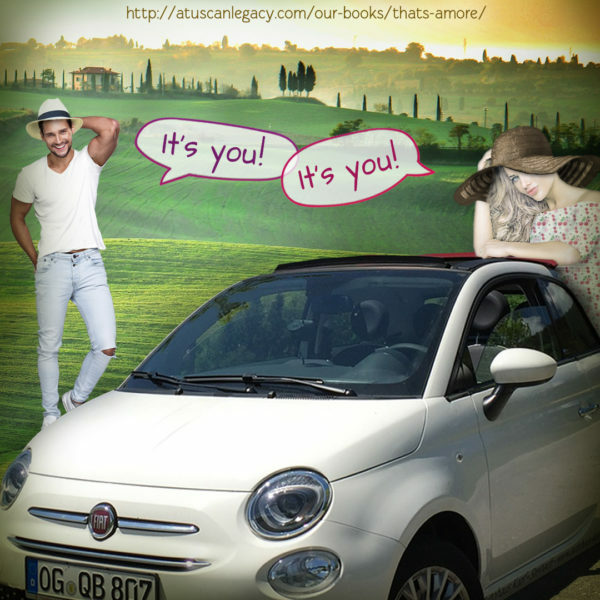 Jenny, I have loved writing this story set in Tuscany. The stories in the series are set in Tuscany, Rome, USA, UK, and Australia (and I think some places in between LOL). So glad you enjoyed the snippet. Fun excerpt! I really enjoy multi-author collaborations … so looking forward to this! Thanks Jenni. So glad you enjoyed this snipped. The authors in this series have really enjoyed putting it together. We’re just as excited to release it. Another Marion Ueckermann book? YES! This looks so good, I can’t wait! Sounds lovely, must remember to keep an eye out for it. Ooh, I just loved the excerpt! Sounds good! Thanks, Susan :) So glad you enjoyed it. What a great snippet! Can’t wait for this series. Thanks, Margaret. We think it is and are confident that readers will enjoy the series. I’m hooked! Can’t wait for it to release! Good Afternoon Marion! Enjoyed your blog and looking forward to this series and your two books. Love reading books with European settings. This has been an unusual February for Southern Michigan / northern Indiana / and across the Midwest. In Michigan we received 15 inches of snow a week ago. Then on Tuesday it rained all day – the area received 5 inches of rain with temperatures in the sixties. The snow melted, the ground is frozen, and all the creeks are over flowing, now the rivers – eventually this will flow into the Great Lakes. Always hits the poorest neighborhoods. Much pray is needed. Going to see Riverdance (Irish dancing) tonight, but will have to go the back way to the theatre. Best wishes and Happy Writing. Thanks, Renate. I have so enjoyed being in Tuscany with this story and I’m certainly having fun in Rome with book 4. We have had an unusually hot summer, so I’ve enjoyed the past few days of rain we’ve had. Many parts of our country are in desperate need of water. Enjoy Riverdance …its awesome. I saw it in Melbourne in 2003, and then again in South Africa a few years ago, although that cast was about 1/3 of the size of the one we saw in Australia. We used to go to an intriguing pub in Ireland, Johnnie Foxes, that had a pair of Michael Flatterley’s shoes in a showcase on a wall. Oh Marion, I am just beyond excited for this series!! And happy it will be in print. Holding these beautiful covers in my hands and the beautifully written story in between, oh how April 17 can’t get here fast enough!!! Congratulations to you and the other Authors for a set that will be very uplifting!! Thanks, Sharon. We’re as excited as you for this series. This fun snippet only makes it harder to wait for its release! I CAN’T WAIT!!! Sounds like a delightfully interesting book!! I love looking forward to new books, authors and new series. I am a type of person who enjoys reading books that are in a series in order. I am eagerly awaiting your series also. I am an armchair tourist to your fabulous adventures. Oops, I hit send too soon! 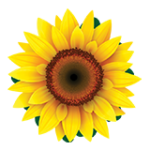 I meant to add – I’ve read enough of Book 1, Marion’s story, to be SURE readers will love ir! Looking forward to the series, waiting patiently(not). Sounds an interesting assortment of stories. Thanks for this opportunity. Thanks, Nancy. Hope you get to read the whole series. Love this series and can hardly wait to read this one. Wow, I’m hooked, I can’t wait for it to release! Wow! Looks phenomenal! Can’t wait r read it. Wow! I cannot wait for April to come fluttering by. It will be a little cooler here in Australia too, being Autumn (one of my favourite seasons). I am also excited that this beautiful collection is available on Kindle Unlimited. Yeeha! Thank you for the sneak peek into “That’s Amore” it sounds adorable. Italy and romance go together so well. My beloved husband is half Italian, and my dear brother-in-law is full Italian. However, the first Italian romance I ever read was about twelve years ago, when I read Lisa Clifford’s “The Promise”. All the best for release day. I hope the days pass by smoothly and efficiently for you, even though I am a wee bit impatient. So glad you enjoyed the snippet, Josephine. I hope we do the Italians proud with this series. Sounds wonderful. Would love to be able to read it! I really enjoyed this excerpt and would like to read more. Thanks for giving away a copy of your book to one fortunate person. So glad you enjoyed it, Pam. All the best in the draw for the free copy. Marion, I loved the excerpt! So happy to be part of this series! Thanks for the excerpt. Sounds like a good book! I haven’t read any of the series by looks like I should put them on my TBR list. I loved the excerpt. Thanks for sharing. Thought I replied before,but did not see it when I looked over names. The series sounds great. I can’t wait to read it. I’ve enjoyed the sneak peek, beautiful cover!